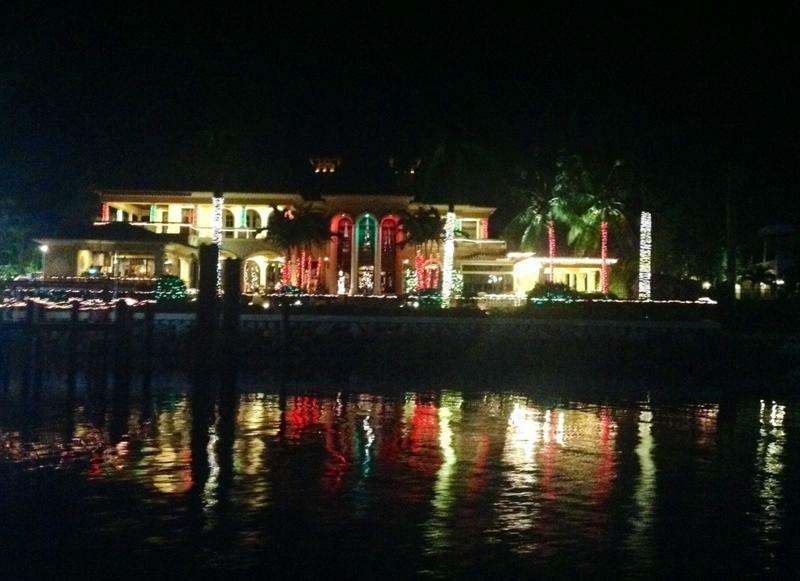 Once again, we continued along the Intracoastal Waterway long after sunset; an afternoon review of the forecast told us we mustn’t delay our departure. In fact, we would need to set sail a day earlier than we’d planned. Brian an I were getting used to this travel by night; but we were exhausted, famished, (oh, poor cruisers trying to keep a 6:00am-8:00pm schedule) and still had 13 statute miles and 7 bridges between us and the next anchorage. Rode Trip creeped along the canal under cover of darkness, with the stealth of Kung Fu Panda barreling through the forest, her engine broke the humid, still silence of the night roaring, “RRRAAA-RRRAAA-RRRAAA.” Brian was at the helm and I at the spotlight, majestic displays of holiday lights held our spirits high. 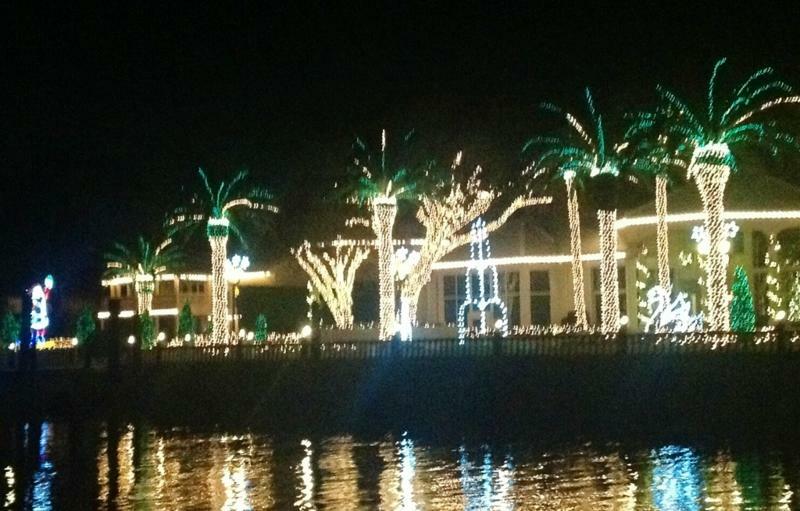 We slipped into Lake Worth, FL and headed toward the cluster of anchor lights twinkling in the sky on the vast, dark lake. We set the hook, back of the row. Another review of the weather to make certain we weren’t being too rash about this decision. This was our chance to make tracks. We changed our dirty clothes (worn the entire trip from St Marys, yuk!) and dropped the dinghy into the water to head to the grocery store. Publix was just a short walk from the dinghy beaching area; a shady looking spot up a narrow creek and beneath a bridge. I spotted a cockroach crossing my path in the flashlight beam as I hoofed up the hill toward the roadway. Grocery shopping was a blur and I know we bought several, spontaneous items because we were leaving the states. The one very important thing we did buy was a frozen pizza and as soon as we got back to the boat that pizza went straight into the oven! Last minute internet chores were checked off our lists and we contacted our parents to inform them of our float plan. When the alarm sounded the next morning I’d thought I’d just laid my head on the pillow. 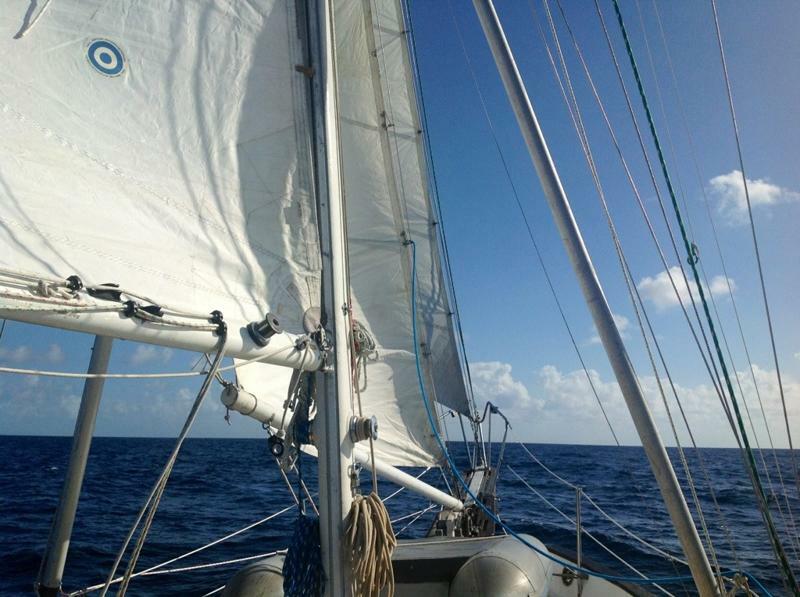 We hauled anchor, made one pit stop for fuel, and set out into the great blue yonder. The trip was entirely uneventful, except for a few squalls passing through at dawn during our second day at sea. 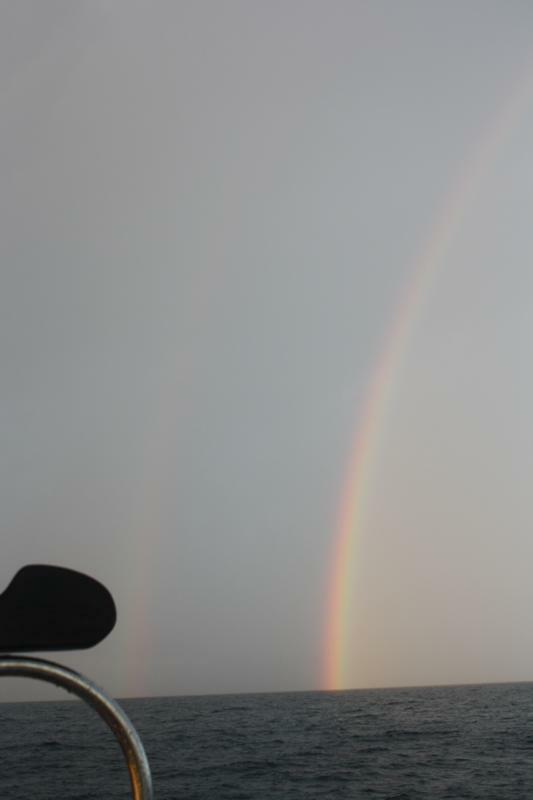 I spotted two sets of double rainbows between the downpours. 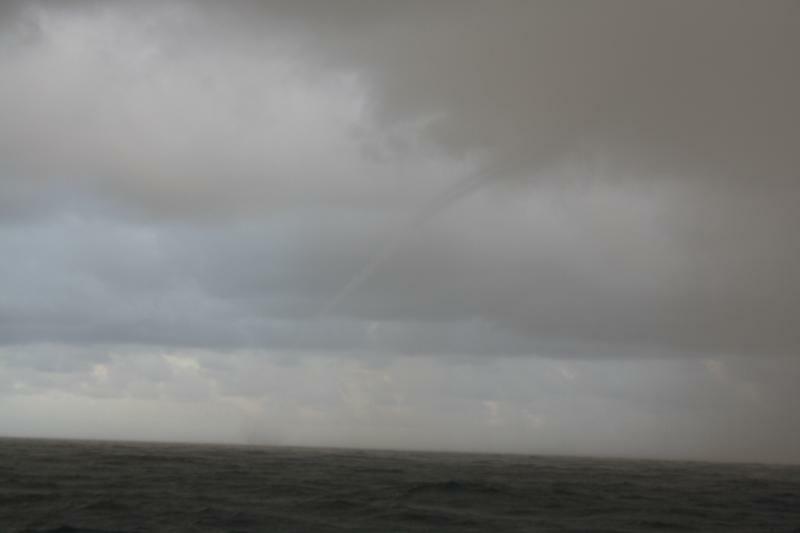 And three waterspouts, the first close enough that we hastily dropped the sails and motored in the opposite direction. We motored the entire way to the Berry Islands and dropped the hook after dark in Bullocks Harbour. Beneath the light of a nearly full moon, we tidied the deck and spotlighted the water to admire its clarity as even at night we could see down to the sandy, grassy bottom. The night was warm; warm enough to take advantage of the privacy offered by darkness. Cockpit showers! Feeling refreshed, we ate a quick pasta dinner and settled into bed. The next morning there were no alarm clocks, rather roosters crowing from the nearby island woke us from a peaceful sleep. We ate a hearty breakfast and readied our paperwork in order to meet with customs. 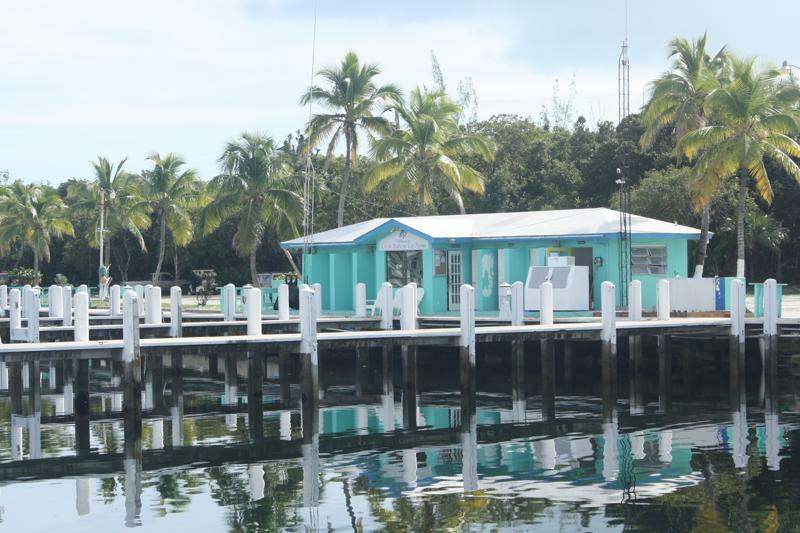 I hailed the Great Harbour Cay Marina on the VHF and they assigned us a slip as we made our way into the harbor. 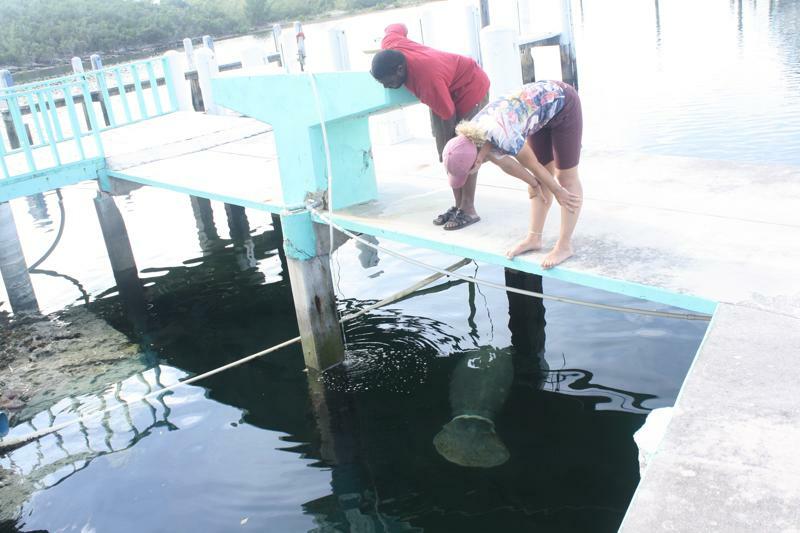 Great Harbour is fantastically sheltered, the marina is quaint, and the locals friendly. Raymond assisted us into our slip and contacted customs. 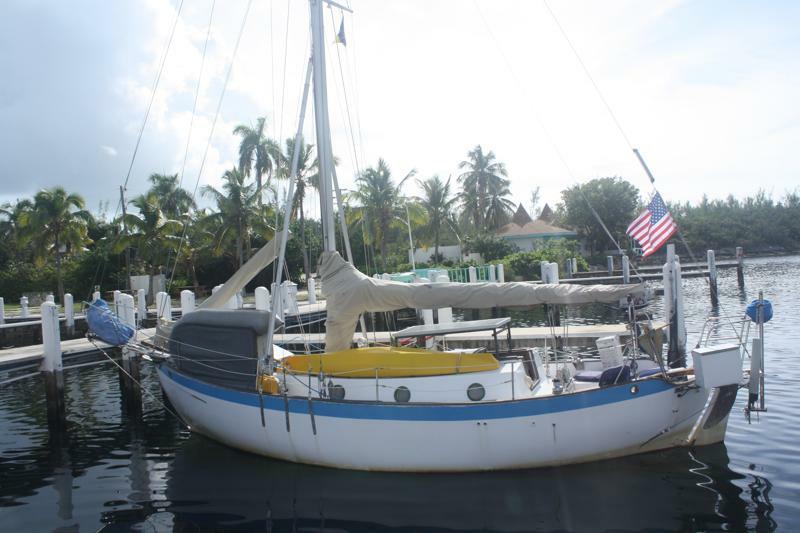 We had decided to treat ourselves to one night at the marina for laundry, internet, and showers ($1.50/ft). Miko assisted me with laundry, he ran water into the machine via hose and waited until the rinse cycle to fill the machine with the hose once again. 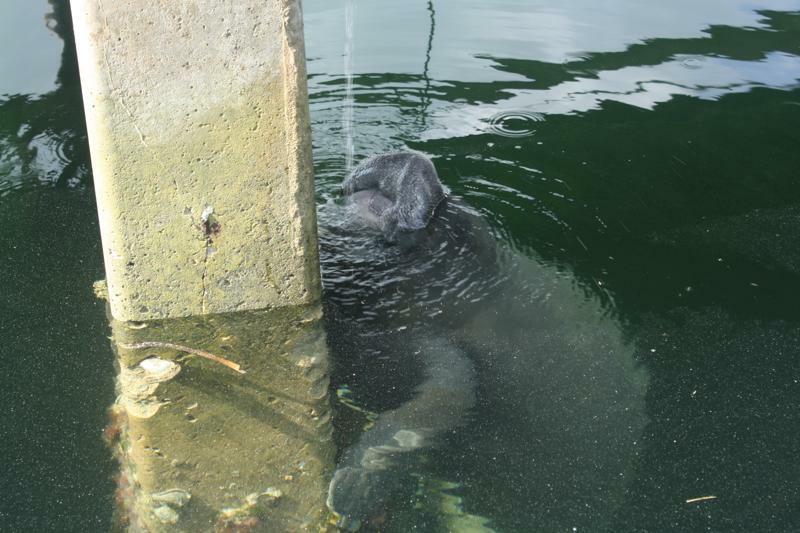 Between washing, Miko introduced Brian and I to the marina manatee. We gave her fresh water to drink and watched her chow down on a lunch of piling growth. 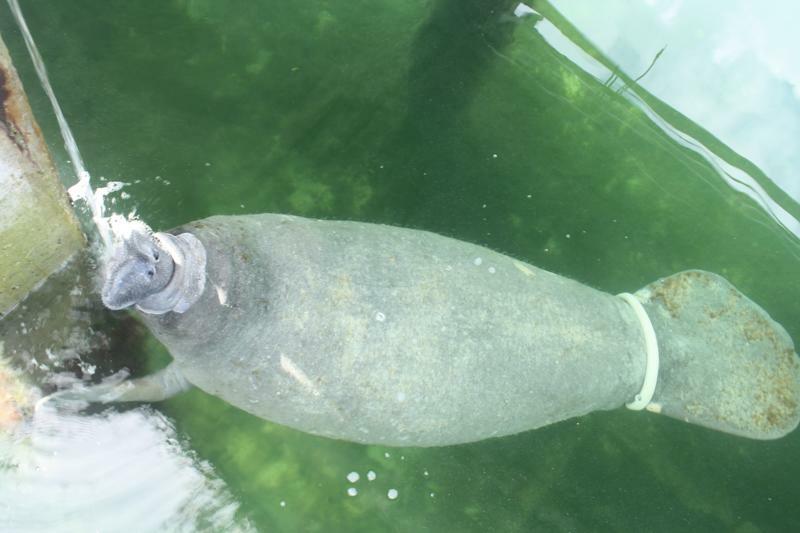 The band around the manatee’s tail was put there for tracking, but it is rubbing her tail and cutting into her skin. Miko says attempts to remove the band have thus far failed. More to come from the Berry Islands. So far enjoying a bit of R & R dockside!